Maybe the Ayatollah was right; perhaps the creators of artistic creations that are blasphemous should be strung up. Metallica’s recent performance in Tokyo brought this issue to mind, but they saved their necks by producing absolutely, nothing that could be interpreted as an artistic creation. Not since Motorhead has heavy metal endured such affrontery. But whereas Motorhead, the progenitors of speed metal, became palatable and remained unsuccessful by playing to their strengths, Metallica have become hugely successful and obscenely unmusical by concentrating on their deficiencies. At first, both the public and the media were slow to pick up on the band. Indeed, they have achieved their success in the face of either negative reaction or no reaction at all. Radio stations avoided them like the plague. But the band won through and their ” … And Justice For All” album has racked up sales of 1 million in the United States, which just goes to show how many sick people there are in the world. With, the success of “Justice,” the media have been crawling over the band like maggots. 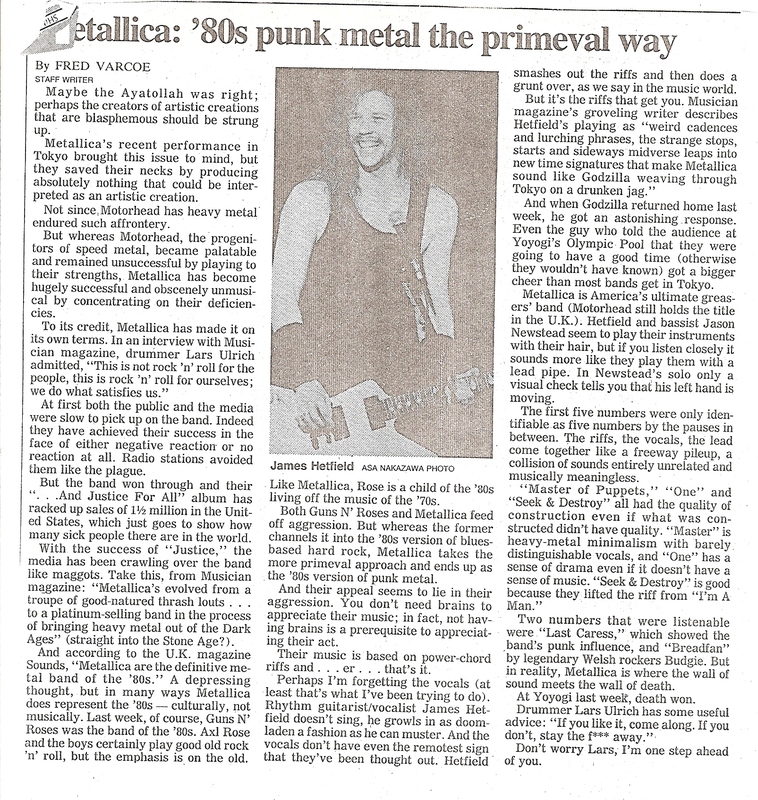 Take this, from Musician magazine: “Metallica’s evolved from a troupe of good-natured thrash louts … to a platinum-selling band in the process of bringing heavy metal out of the Dark Ages” (straight into the Stone Age?). 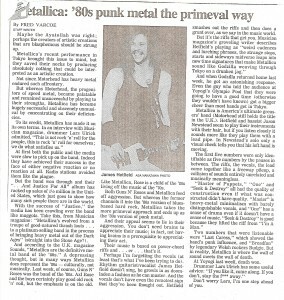 A depressing thought, but in many ways Metallica do represent the ’80s – culturally, not musically. Last week, of course, Guns N’ Roses were the band of the ’80s. Axl Rose and the boys certainly play good old rock ‘n’ roll, but the emphasis is on the old. Like Metallica, Rose is a child of the ’80s living off the music of the ’70s. Both Guns N’ Roses and Metallica feed off aggression. But whereas the former channels it into the ’80s version of blues-based hard rock, Metallica take the more primeval approach and end up as the ’80s version of punk metal. And their appeal seems to lie in their aggression. You don’t need brains to appreciate their music; in fact, not having brains is a prerequisite to appreciating their act. Their music is based on power-chord riffs and … er … that’s it. Perhaps I’m forgetting the vocals (at least that’s what I’ve been trying to do). Rhythm guitarist/vocalist James Hetfield doesn’t sing, he growls in as doom-laden a fashion as he can muster. And the vocals don’t have even the remotest sign that they’ve been thought out. Hetfield smashes out the riffs and then does a grunt over, as we say in the music world. And when Godzilla returned home last week, he got an astonishing response. Even the guy who told the audience at Yoyogi’s Olympic Pool that they were going to have a good time (otherwise they wouldn’t have known) got a bigger cheer than most bands get in Tokyo. Metallica is America’s ultimate greaser’s band (Motorhead still holds the title in the U.K.). Hetfield and bassist Jason Newstead seem to play their instruments with their hair, but if you listen closely it sounds more like they play them with a lead pipe. In Newstead’s solo, only a visual check tells you that his left hand is moving. The first five numbers were only identifiable as five numbers by the pauses in between. The riffs, the vocals, the lead come together like a freeway pileup, a collision of sounds entirely unrelated and musically meaningless. Two numbers that were listenable were “Last Caress,” which showed the band’s punk influence, and “Breadfan” by legendary Welsh rockers Budgie. But in reality, Metallica is where the wall of sound meets the wall of death. At Yoyogi last week, death won. Don’t worry, Lars, I’m one step ahead of you.